Merry Christmas + Happy Holidays to all my lovely readers! I’m headed all over the country (thanks Virgin America + Google for the free wifi right now so I can get some work done!) to visit family and friends this next week and a half. I hope everyone is taking some time to spend with their loved ones – that is what this time of year is about. I’m also ready to enjoy some time away from the computer and playing with my cameras. :) I do have some posts planned for next week though, so check back on Monday. And in honor of this most fabulous holiday, a beautiful board of bright reds and mossy greens – so perfect for the holidays! love that deep rich red. Love those cranberry dresses. Very "Oscars". Love the red dresses. Do you know the designer? Would love to snag one in white! Those dresses are so beautiful and stunning! Have a wonderful Christmas, Jen! I want to know what is in the first pic…yum! you have a beautiful blog!!!! from one LA chick to another…happy holidays! This is a great board with some amazing images. 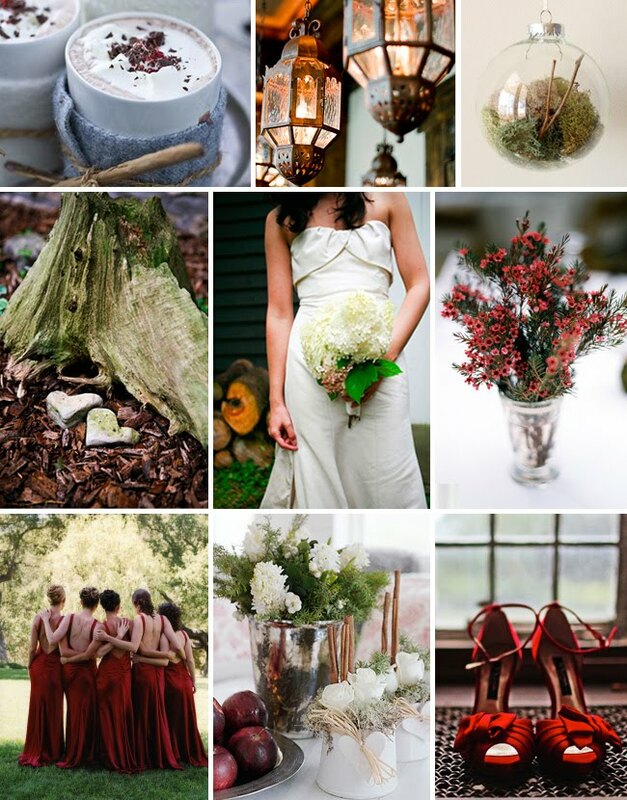 Love the coco, tiny red floral arrangement and those long red bridesmaid dresses. gorgeous inspiration board Jen! Enjoy your vacation! Happy Holidays!! Aww those are my wedding shoes! They dye very beautifully in red. I like! And who is the designer of those bridesmaid dresses? Happy Hoildays also to you and to all the people behins greenweddingshoes! I wish you all more great posts! Love the gorgeous bare back dresses in deep red hues.Quite a nice match for the hot red shoes! I love the photos in this blog!!! Girls looks fabulous in the red color,my favorite one color.